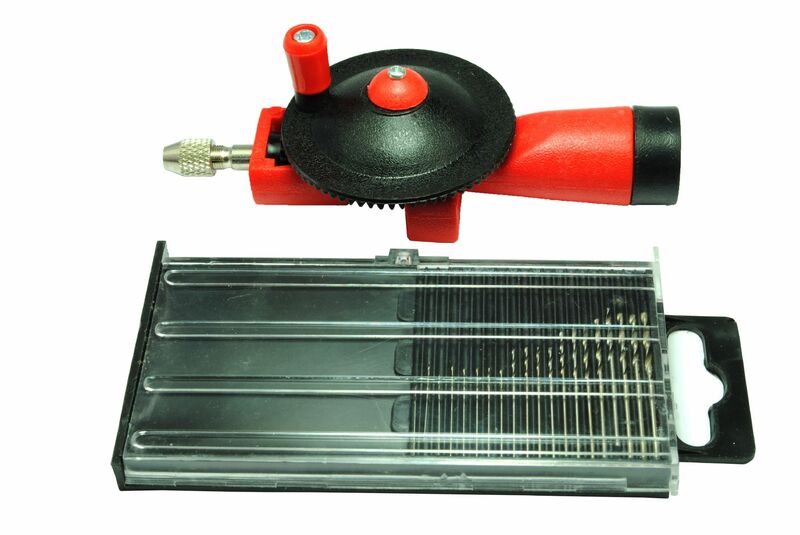 Drill set is contained in a plastic indexed box with sliding window. The perfectly designed box keeps bits securely in place and dispenses the drill bits only one bit at a time. 0.3 mm, 0.35mm, 0.4mm, 0.45mm, 0.5mm, 0.55mm, 0.6mm, 0.65mm, 0.7mm, 0.75mm, 0.8mm, 0.85mm, 0.9mm, 0.95mm, 1.0mm, 1.2mm, 1.3mm, 1.4mm, 1.5mm, & 1.6mm. Details of the little drill- takes drill bits 03-0.9mm officially but we have used them with 1.2mm drill bits bit tight but do work fine. Screw off lid on handle for drill bit storage.